Once upon a time there was a little girl who had long golden hair and for this reason she was known as Goldilocks. Goldilocks lived with her mother in a pretty little house at the edge of the forest. One day, she said other mother, ''I'm going for a walk, and I'll bring back a beautiful bunch of flowers which I'll pick especially for you. '''That would be nice, Goldilocks. But be careful not to go too far. You might get lost!'' her mother warned. 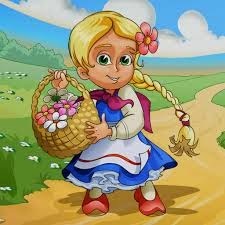 Goldilocks hugged her mother, hung her basket on her arm and went off. She began by picking some beautiful big white daisies. Then, a little further on there were some blue cornflowers. And further still, there were glorious red poppies. As she ran from flower to flower, Goldilocks began to lose all sense of time. She soon became tired, and began to feel very hungry and thirsty. Fortunately, she saw a little house amongst the tree. She looked through the keyhole, and as she couldn't see anyone inside, she pushed open the door and walked right in. Inside there was a big table laid with three bowls full of honey and rice. It smelt delicious! There was a big bowl, a middle-sized bowl and a little bow. Around the table, there stood three chairs which looked very comfortable. There was a big armchair, a middle-sized chair and a little chair. Goldilocks sat down in the big armchair, but it was too hard and she felt uncomfortable. She tried the middle-sized chair, but the cushion was too soft and she slid about on it. So she sat down in the little chair, but she was too heavy, the legs broke under her and she fell on the floor! Feeling very hungry, she decided to taste the rice and honey pudding. She took a spoonful from the big bow, but it was too hot and she burnt her tongue. She tried the middle-sized bowl but it was too lumpy. Finally, she tasted the little tiny bowl. The pudding was absolutely delicious, and Goldilocks gobbled up, every last drop! As she was very tired, Goldilocks felt like having a little sleep. She went upstairs to the bedroom where she found three beds. There was a big bed, a middle-sized bed and a little bed. She tried the big bed but it was too hard and rather uncomfortable. She tried the middle-sized bed but the blankets were scratch and she could not get to sleep. She lay down in the tiny little bed, and as it was so comfortable and warm, she fell fast asleep. 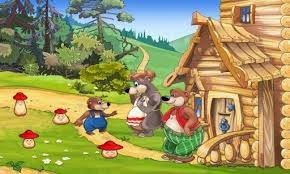 Meanwhile the family of bears who lived in the house, arrived home after their walk in the forest. As soon as they opened the front door, they could smell that someone had been there and they began to search the room, sniffing everywhere. ''Someone has been sitting on my chair,'' exclaimed Daddy bear, in his big, deep voice. ''Someone has touched my cushion,'' cried Mummy Bear in her gentle voice. ''Look, someone has broken my chair!'' said Baby bear in his squeaky little voice, and he burst into tears. Then the Bears went over to the table. ''Someone has licked my spoon,'' growled Daddy Bear in his big, deep voice. ''Someone has touched my bowl,'' said Mummy Bear in her gentle voice. ''Look, someone has eaten up all my pudding, and there is nothing left!'' cried Baby Bear, and tears rolled down his long nose. Then the bears went upstairs. Daddy Bear sniffed and growled in his deep voice, ''Someone has been lying on my pillow!'' ''Someone has moved my blankets,'' said Mummy Bear quietly. ''Look, look, there is a little girl asleep in my bed!'' shouted Baby Bear, in surprise. 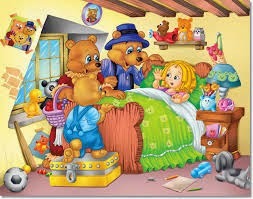 When Goldilocks heard the voices, she woke up. Seeing the three bears leaning over her, she was very frightened. She jumped quickly out of bed, leap through the window, and ran off into the forest. She ran home as fast as she her legs would carry her, without looking back once! And the bears never saw Goldilocks in the forest Again.